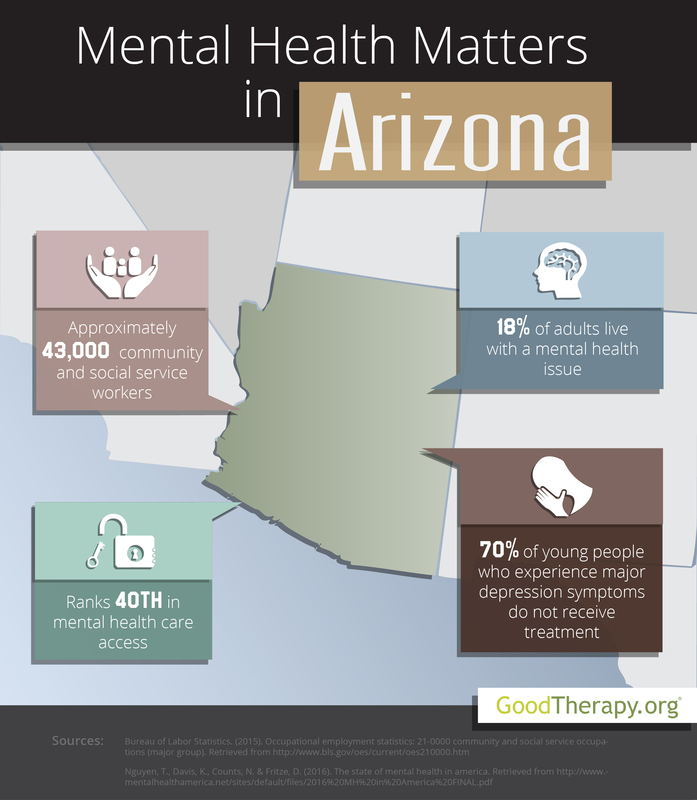 Find a therapist in Arizona with GoodTherapy.org. Data from the United States Census Bureau indicates the state of Arizona had a population of 6.8 million people in 2015. According to the Bureau of Labor Statistics, approximately 43,000 residents work in community, health, or social service fields during the same year. Common occupations within this sector included work at residential treatment centers, correctional facilities, schools, hospitals, mental health facilities, drug and alcohol detox centers, and community centers. Workers in these fields earned an average salary of $42,990 each year. Out of all 50 states and the District of Columbia, Arizona was given an overall ranking of 50th by the annual Mental Health America (MHA) survey in 2016, which indicates high rates of mental health issues and low access to care. Factors which may have contributed to this ranking include high rates of poverty and low rates of high school graduation in the state. Arizona was ranked 40th in prevalence of adverse mental health conditions (high rankings indicate a higher prevalence) and 40th in access to care. The ratio of mental health providers (including psychologists, psychiatrists, clinical social workers, counselors, mental health nurses, and marriage and family therapists) to people who make up the general population is 1:839. Approximately 61% of adults with mental health issues do not receive any professional care, while 22% of adults with mental health issues have no insurance. According to the MHA 2016 survey, Arizona is 47th in youth ranking—which may indicate a high prevalence of mental health issues among young people in the state, and low rates of access to mental health services for young people. While there are a number of issues which may affect minors, clinical depression and abuse of drugs and alcohol are two significant concerns for the state. Arizona is ranked 41st for young people experiencing substance dependence issues, indicating a high prevalence. Researchers from Mental Health America contend that approximately 34,000 minors in the state display abusive or addictive behaviors toward alcohol and illicit drugs. They also report roughly 44,000 young people currently experience severe symptoms of major depression, while 59,000 teens had at least one episode of major depression in the previous year. Despite these statistics, only about 6000 minors received professional mental health services on a consistent basis. The data shows that of all young people with major depressive episodes, nearly 70% did not receive any mental health care. Adults and young people with mental health issues may consider finding a therapist in Arizona who is able to provide them with professional care. Therapy can address many psychological and behavioral concerns, and many people are able learn skills to cope with their issues and live a more rich, fulfilling life after undergoing treatmentt.